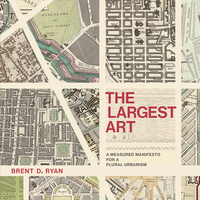 Please join us in welcoming Brent Ryan, author of The Largest Art to the MIT Press Bookstore. Joining him in discussion from the Harvard Graduate School of Design will be Rahul Mehrotra, Professor of Urban Design and Planning, and Alex Krieger, Professor in Practice. This event is free and open to the public. Copies of the book will be available for purchase, or you may pre-purchase a book at a 20% discount. Urban design in practice is incremental, but architects imagine it as scaled-up architecture—large, ready-to-build pop-up cities. This paradox of urban design is rarely addressed; indeed, urban design as a discipline lacks a theoretical foundation. In The Largest Art, Brent Ryan argues that urban design encompasses more than architecture, and he provides a foundational theory of urban design beyond the architectural scale. In a “declaration of independence” for urban design, Ryan describes urban design as the largest of the building arts, with qualities of its own.